First of all, for those of you looking for the gravy recipe to go along with The Best Mashed Potatoes, I’ve added it to the post. Just scroll down and you’ll see ingredients and directions at the bottom below the recipe for the mashed potatoes. I had originally intended to make a separate post, just for the gravy, but since I’m an amateur food photographer and I’m learning as I go, sometimes my pics turn out TERRIBLE, as was the case for the gravy! Now that we’ve got the taters and gravy covered for Thanksgiving, it’s about time we tackle the stuffing. As I mentioned yesterday, I agonized over whether I should make traditional stuffing, or corn bread stuffing. Ultimately, the corn bread stuffing won, largely due to this recipe for homemade old-fashioned corn bread. Ashamed is a good word to describe how I feel about the fact that I’ve only ever used boxed stuffing any time I’ve been responsible for putting Thanksgiving Dinner on the table (please tell me I’m not alone!!). The thought of making homemade stuffing seemed so intimidating and so daunting, but how could I possibly put boxed stuff on the table when everybody knows I’m a FOOD BLOGGER, for crying out loud. Anyhow, my adventure in homemade-stuffing-land wasn’t quite as scary as I had anticipated. In fact, it was sort of a fun process, starting with making homemade corn bread, and cutting it into chunks to dry out and become stale. 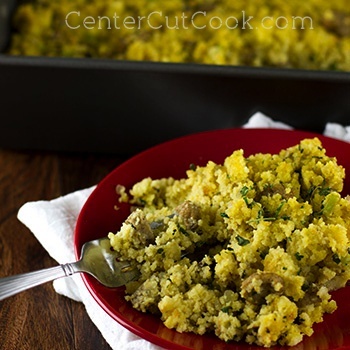 Good stuffing starts with stale bread, so don’t skip this step! You’ll need a good 24 hours, but more if you can, to dry out the bread. Aside from waiting for the bread to become stale, this recipe comes together quite quickly and is so versatile. You can add any herbs you’d like, but I went with thyme and sage. Rosemary would be another good choice. Additionally, you can make this vegetarian by simply omitting the sausage and chicken stock and replacing it with vegetable stock. The sausage was a really nice touch, so I recommend keeping that in. If you’ve never made homemade stuffing before, I encourage you to try it because it wasn’t nearly as scary as I thought it would be, and it turned out great! Also, a little tip! If you make a huge pan of it like I did, and have a ton leftover, scoop the cooked stuffing in muffin tins and freeze. Once frozen, the cups of stuffing will easily pop out of the tin and you can place them in a freezer bag and back into the freezer. Then you’ll have single serving stuffing cups ready for any night of the week. You’d just take out however many cups you need and thaw overnight, heat the stuffing until warm, and serve. Beforehand: Make the corn bread at least 1 day before you’ll need to make the stuffing. Cut it into one inch chunks and arrange on a large pan in a single layer. Allow the bread to sit out, uncovered, for at least 24 hours to become stale. You NEED stale bread for this recipe, so this is a key step. On the day of: Preheat the oven to 350 degrees. Cook the breakfast sausage until cooked through. Drain any excess fat, cut into small pieces if you used links, and set aside. In a large skillet, heat 1 tablespoon olive oil over medium-high heat. Cook the onion, celery, and mushrooms for 10-15 minutes, or until the veggies have softened. Season to taste (I added a little salt and pepper while they were cooking, but didn’t measure how much. Just eyeball it.). Add in garlic and cook for another two minutes. Stir in sage and thyme and cook for another minute or so. Add the breakfast sausage to the veggie mixture and stir to combine. Remove from heat. In a large bowl, combine veggie mixture with the stale corn bread chunks. Once combined well, add in chicken stock. You may need to use your (clean) hands to get the mixture combined well. Add salt and pepper if needed. Pour mixture into a large casserole dish (I used a large roasting pan) and place into a 350 degree oven for about 35 minutes.